York Theatre Royal is a theatre based in York. They have been delivering Arts Award (Explore, Bronze, Silver and Gold levels) for over five years in several different formats, adapted for a variety of projects, and with various different groups and individuals. These include members of their youth theatre, work experience placements, youth theatre assistants and volunteers, participants in play in a week or outreach groups, those involved in Takeover and others. York Theatre Royal use their setting as a professional theatre to full advantage when delivering Arts Award, by giving young people access to arts professionals that work within the theatre. This is coordinated through one-to-one interviews with actors along with promenade tours where young people discover members of staff in their roles and can ask them questions and other methods. York Theatre Royal took part in the original pilot for Discover and Explore. 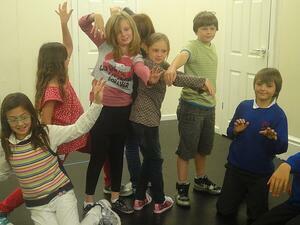 They worked with one of their 8-10 youth theatre groups on a King Lear project for Explore. Once Arts Award Explore was launched, they then worked with three other youth theatre groups to achieve Explore. To meet Part A (inspire) of Explore they delivered their youth theatre sessions and activities inspired by the work of Tutti Frutti, a story-based children’s theatre company. For Part B (explore) they saw Tutti Frutti’s play, The Hare and the Tortoise, and interviewed the show’s director and actors about the show and their roles. To find out more about an arts organisation they also got involved in a participatory theatre tour of York Theatre Royal, seeing different theatre staff in action (eg costume cutters making panto costumes) who told them about their jobs and answered questions. To achieve Part C (create) they created their own modern day fables in small groups over several weeks and performed these for friends and family at a sharing session at the end of term. During the sharing session, the participants also shared their portfolios and talked about what they had done during the term, meeting Part D (present). 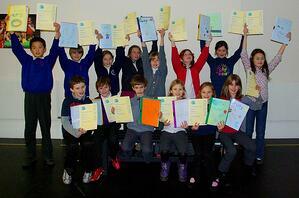 In addition, the fables were directed by some young people doing their Silver Arts Award. York Theatre Royal’s young people are given many options in how to create their portfolios, but the majority choose to present them in paper format. Two of their Silver participants created digital Silver portfolios but also wanted to replicate them in scrapbooks. York Theatre feel they are fortunate to be well placed in working with many artists such as actors, writers, directors and creative teams on a daily basis. 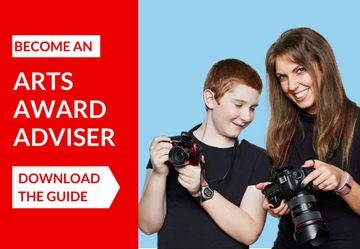 All those participating in Arts Award can access these arts professionals and they can share working knowledge of the industry, tips for how to succeed, and answer questions that the young people may have about realistic costs and how difficult it can be. York Theatre Royal report that Arts Award has had a large impact on the young people they work with, which they feel has been demonstrated through the number of young people that have completed several levels. Many of those that have completed their Arts Award have found professional work as a direct result of the networking and work experience that they have undertaken as part of their award. For example, Eleanor Taylor did her Silver and Gold with York Theatre Royal and went on to work with Derren Brown after interviewing him for her Gold debate. She also presented one of the Arts Award DVDs at a celebration for Arts Award at The Globe with Ben Shepherd. She is now at RADA doing her MA in directing. York Theatre Royal has also worked with a young person who was in foster care. She completed her Bronze during their play in a week. This was the first qualification she had achieved and helped her to gain more confidence. Many of the young people they have worked with through Arts Award have successfully resolved challenges, such as a young person with autism being able to overcome great personal challenges through taking part in his Silver Award through York Theatre Royal’s Takeover project.